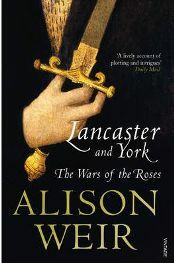 Lancaster and York: The Wars of the Roses by Alison Weir is an historical book covering much of the fifteenth century, and some of the fourteenth century, chronicling and examining the causes, effects and the course of the Wars of the Roses. The Wars of the Roses were, in simplistic terms, the struggle between the houses of Lancaster and York for the crown of England during the fifteenth century. Henry VI of Lancaster was descended from an usurper of the throne, and so when he turned out to be a feeble and easily led ruler, the crown was taken by Edward IV of York, who asserted that he had a better claim to the throne and that he would be a better leader. There were many battles and struggles between the two houses and their many supporters, and it was a particularly bloody period in England’s history. Weir examines the causes of and run up to the Wars of the Roses as well as the actual period itself, which was the 1450s to 1480s. This gives a fascinating insight into why things got this bad. It is also good for those readers such as myself who know next to nothing about this period of English history. Weir sets the scene and gives her readers a sense of place, and is very clear in her writing so as to give the reader a good understanding of where it all went wrong. Lancaster and York is a very detailed examination of the Wars of the Roses, but while Weir does look at the details and cover every aspect of the struggles, the text never becomes bogged down in irrelevant or endless picky details. She writes in a way that gives the reader all the information they need, while continuing to flow through the action in a style which captures your attention. Surprising as it may sound, history is a page turner. The period that Lancaster and York covers was, of course, full of action. Perhaps not so good for the people who lived in England during that time, but it certainly makes for good reading. Even the times between battles and invasions are not dull, as whichever faction was in power was rarely free to live in peace without fear of more attacks. This tension transfers itself to the text, and so there are really some nailbiting moments in Lancaster and York, waiting during the calm before the storm. Weir tells the story from both sides of the conflict as well as she can. Records from the fifteenth century are good, but not everything is known, particularly during times when a leader was in exile or in hiding in England. She does well to fill in the gaps, and will often put forward the most plausible explanation for what happened during the time we have no facts for. Additionally, there are events which are disputed by historians and for which differing accounts may exist: Weir discusses these, and presents the most likely account, along with an explanation of why this is the most likely. Many “facts” have to be taken with a pinch of salt: for example, the size of an army is likely to be overestimated, particularly if the chronicler is a supporter of the army. On these occasions, Weir always gives the figure taken from records, and the figure determined by historians to be more likely to be accurate. Many of Weir’s books focus on the Tudor dynasty, which of course followed from the Wars of the Roses. It was as a result of the Wars of the Roses that the Tudors were able to come to power, and so having read much on the subject of the Tudors, it was very interesting to read Lancaster and York and understand the background to their rule. Another factor of Lancaster and York covering the period before Tudor rule is that we are that bit further back in history. The time of the Wars of the Roses, and the period prior to it which Weir also covers in Lancaster and York, is truly in the medieval period. There are even more noticeable differences between life today and the time of the book than there are in Weir’s writing about the Tudor period. However, this is not a problem, as Weir is very clear in her writing and explanation of a life which is so foreign to us today. At no point do you feel like you are struggling to understand how things were. Lancaster and York: The Wars of the Roses is a fascinating read. It could be read as a starting point to moving on to reading about Tudor times, or for those who know about the Tudor dynasty, it would give a good background to that time. No Comments on "Lancaster and York: The Wars of the Roses"
A Scottish lass in her late twenties living in London. A prolific reader always interested in something new.